A lot of people's favorite villains are the heavy hitters. Dr. Doom. Darkseid. Magneto. But I've always had a fondness for the working class villains, the ones that just want to rob a jewelry store, get out without hurting anyone they don't have to, then go blow their paycheck upgrading their gear or gambling or paying their child support. 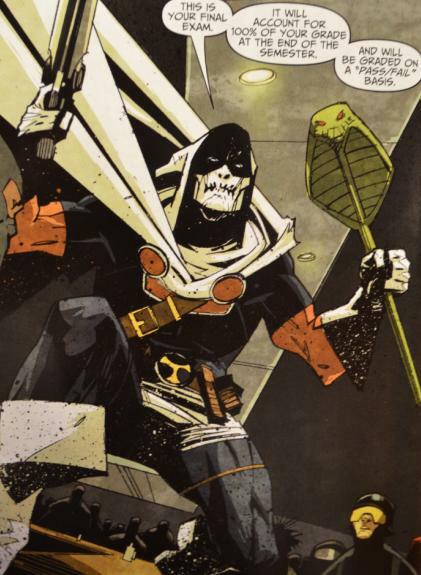 There's a lot of guys like this, from the Flash's Rogues to Batroc the Leaper, but one of my consistent favorites is Taskmaster, and they finally gave him a miniseries a few years back. And it's great. Taskmaster has a very easy to grasp power: photographic reflexes. This basically means that if he sees someone do something, he can do it himself, as long as it's primarily physical, like fighting, shooting, or driving. He's limited by what he can physically do, so while he can throw a punch in the style of the Hulk, he can only throw one as strong as a normal, athletic human. So, given his skillset, he did what any smart, morally challenged person in the Marvel universe in his position would do: he hired himself out as a trainer for every organization that he could, teaching all their mooks how to fight. The downside to his power, and one that I think is first shown in this mini (although I could be mistaken and would love to hear if I was) is that he has almost no regular long-term memory. He could fight you like Captain America, vault around buildings like Daredevil, and shoot a bow like Hawkeye, but he couldn't tell you where he was last Tuesday. He doesn't remember his real name. He doesn't know who his family is or if he even has one. The book starts with him finding out that he has a billion dollar bounty on his head for turning state's evidence on the criminal organization that has helped him book gigs training thugs for AIM, Hydra, and every other criminal organization in the world, along with a few new ones made just for this book. Taskmaster find himself in the position of having to work his way back through his past to find out who has framed him and why and hopefully figure out who he actually is and where he comes from. It's an origin story told as a whodunnit, and it's brilliant. The writing is sharp and funny throughout, with what can probably be best described as comedy noir. It's funny and bleak at the same time, as a guy who's bad (but never really too bad) tries to work out the ways that he's hurt people, including ones that are supposed to be his friends. The dialogue is clever, and the new villain organizations that Van Lente have cooked up are wonderfully goofy: everything from the Black Choppers (motorcycle-riding aliens) to the Minutemen (thugs dressed and armed like, well, minutemen) to the Dia de los Muertos-themed minions of the Don of the Dead. 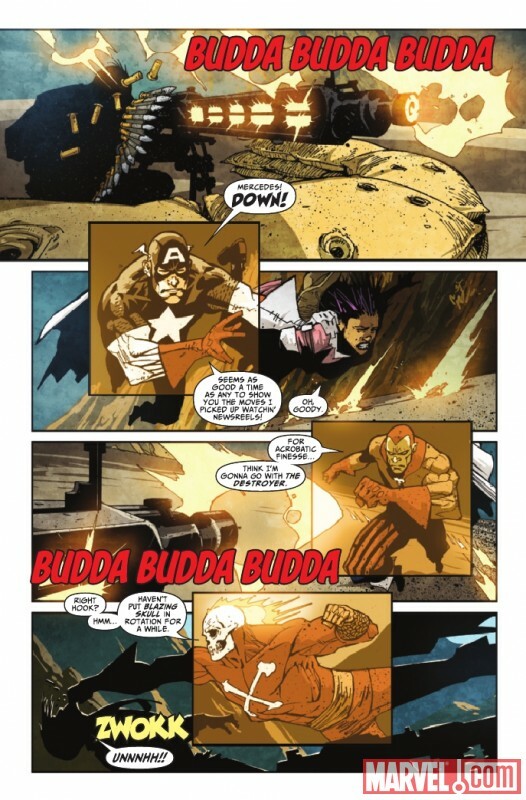 The art is good, if a little busy, but there's one really great stylistic choice: when Taskmaster switches to a new fighting style, a small sepia-toned illustration of the hero or villain he's mimicking is overlaid on Taskmaster. It's a nice touch to give a feel for how the character's powers work. There's a lot more good stuff to be said for the book, but most of it would involve spoiling one of my favorite origin stories, so I suggest you go read it instead. It's pretty cheap on Amazon, or you might be able to find a copy locally.